Anju Anand is an engineer by training. However, after a series of stints in the corporate world, she found her calling in teaching. She began her journey of teaching with “Khel Khel Mein”, an experimental mathematics lab that brought various concepts like area, volume, and magnitude of numbers alive through games. Now, a teacher of mathematics and geography in middle school, Anju believes in taking a practical approach to teaching concepts that are often quite abstract for a child. Outside of work, she is a content mother and loves to explore her spiritual side. I love numbers. I feel numbers talk to me. It hurts me when I hear of children being afraid of mathematics. Math is all around us and it should not be enclosed in a textbook. For young children, understanding mathematics with abstract numbers can be challenging. Numbers have to come alive for them to really connect and relate to what they are being taught. Bringing numbers to life has been my passion ever since I joined Vidyaranya High School as a grade V mathematics teacher. My mind is always occupied, working on a project or an activity on how we can teach a math concept by taking numbers from our environment. Another thing close to my heart is punctuality. “What is the most important thing in your life?” “Being on time,” was the first thought that crossed my mind when Shantamma (Founder, Vidyaranya) posed the question during one of her assemblies. This obsession with punctuality has come from my father who would get ready an hour before we were expected to leave. Punctuality is not taken very seriously in our country. We seem to take other’s time for granted. We don’t seem to think that this is an important virtue to teach our children. Reaching school on time is not a priority. I see children strolling in while the class is going on without any guilt on their faces. Reward and/or punishment are not something we believe in. The responsibility has to come from within. How we awaken that is the challenge. 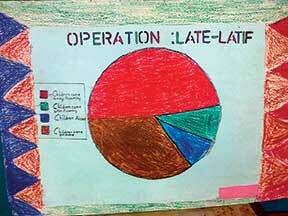 Punctuality and mathematics came together in ‘Operation late latif’, a name given by one of the grade V children when we decided to collect data on children coming late to school. The enthusiasm in the classroom was hard to contain. Children always look forward to an activity where they are doing something different; different from the mundane, like sitting in the classroom and reading/writing. Reading and writing are equally important but once in a while it helps to teach out-of-the-box. Children were divided into groups. Each group had to come up with a proposal, present it to the class, divide the work amongst themselves and be responsible for the task assigned to them. The proposal contained a sketch of the school, places they would stand at (few at the gate, few at the parking lot, etc.) and also a plan as to how they would count the people crossing by. Each group would start the count right after the bell rang; one set of children would start counting children crossing the gate, another would count the children coming from the parking lot, etc. It was the responsibility of one child to keep track of the time. 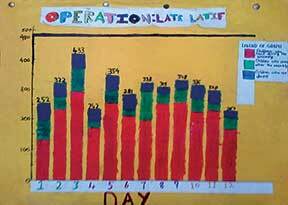 Children realized that in order to make the data more accurate, they needed to know the number of children absent. So some children were assigned the task of collecting the absentee numbers. We collected the data for 12 days (assuming this to be a good sample size). A discussion followed on the right sample size, importance of its size, and how small sample sizes can skew data. Now we had numbers from our environment; numbers we could connect with, that we could relate to, and learn from. Pictures speak more than words and numbers. The concept of a bar graph was introduced – there was a bar drawn for each day; a colour representing different set of numbers (children walking in during assembly, after assembly, and absentees). It was hard to conclude anything from the data in front of us. We could say that half the children came late on the 2nd day, whereas more than two-thirds were late on the 5th day (bad weather). We decided that we needed to take the average into account. An average was calculated – a pie chart was drawn showing the average numbers. Children do hear of averages (average run rate, average goal per match, etc.) but what these averages represent was made clear during this exercise. The children presented their findings to different classes. This data was an eye opener for all of us. Should we do anything about it? What could make children come to school on time? Having games in the first period was the suggestion which won hands down. We don’t reach late for a movie or a match, so why do we come late to school? School is an everyday thing, whereas a movie or a match is a special occasion. What if the municipal committee person thinks the same and does not switch on the pump? There would be no water the next morning! I am thankful to Vidyaranya school for giving teachers the freedom to explore beyond the textbook. I am indebted to my fellow teachers for the support we received throughout. And of course I am ever so grateful to the children who are always ready to jump at any challenge thrown at them.